One Con Glory is an in-the-works independent feature film based on the geek romantic comedy novella of the same name. We’re in the very early stages of development right now, but watch this space for updates! You can also read about our journey on io9 or follow us on Twitter and Facebook. The Story: Diehard fangirl Julie loves Buffy marathons, fighting about comic book continuity, and being left alone. But more than anything, Julie loves Glory Gilmore, a mostly-forgotten C-List superheroine from the world of ’80s comics. For years, she’s longed to reclaim the precious Glory action figure that’s eluded her grasp so many times before. And one fateful weekend, she has the chance to do just that. Of course, no great quest is ever simple. Before she can triumph over the forces of loudmouth nerds and clueless Mundanes everywhere, Julie will have to deal with an avalanche of unexpected obstacles. In the midst of battles for videogame supremacy and frustrating encounters with a supremely irritating TV pretty boy, she’ll be forced to reconsider her fandom and reevaluate her life. She might even have to talk to people. 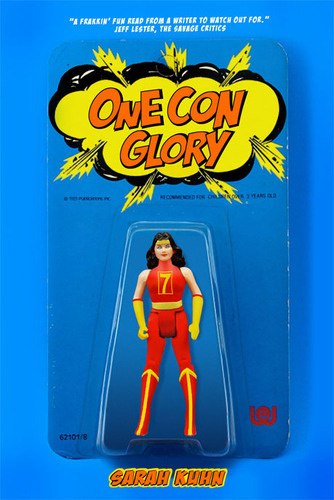 About the Book: Published by Alert Nerd Press in 2009, One Con Glory has earned praise from Pop Candy’s Whitney Matheson, Guardian of the Dead author Karen Healey, io9’s Lauren Davis, The Middleman creator Javier Grillo-Marxuach, The Book Smugglers, and more. For more info or to buy, go here. About the Writer: Sarah Kuhn is the author if the forthcoming Heroine Complex trilogy for DAW Books. Her work has appeared in such fine publications as Apex Magazine, Back Stage, Geek Monthly, IGN.com, The Hollywood Reporter, StarTrek.com, Creative Screenwriting, and The Oakland Tribune. She also contributed an essay to the Hugo-nominated anthology Chicks Dig Comics and has been featured on such popular panels as San Diego Comic-Con’s “Geek Girls Exist” and “Sci-fi That Will Change Your Life” and GeekGirlCon’s “Geek Girls in Popular Culture.” In 2011, she was selected as a finalist for the CAPE (Coalition of Asians Pacifics in Entertainment) New Writers Award. Email her or find her on Twitter. About the Producer: Desiree Hall is an actress hailing from the East Coast and has been seen on popular TV dramas NCIS: Los Angeles, CSI: Miami , and Brothers & Sisters. She stars in the indie feature Donner Pass, in addition to numerous television commercials. Her love of great stories and type-A personality make producing a natural next step. At least until she can start directing. Want more info? Visit here or here .